On the table in about 20 minutes, these steak quesadillas with mango avocado salad are a great DIY family dinner. Spring has sprung and that means spring "every-possible-sports-activity" has also sprung. The time between 3-7pm has suddenly become a juggling act of small portions of portable food - after school snack, pre-activity snack, after activity snack, small portion of dinner before activity, light after activity dinner and of course.... a bedtime snack. I can really only laugh and blame myself. I set it up this way. And each component on its own is fun and my child loves it but it sure is challenging me to up my meal prep and portable snacks game. I never really understood why it was so hard to have a family meal around the table. Now I do. AND I have only one child and a lot of flexibility in my work. To the parents who are both working, juggling multiple children to multiple activities...I salute you. I respect the effort that is involved. And I want to bring you dinner. In lieu of that, there is this dinner. 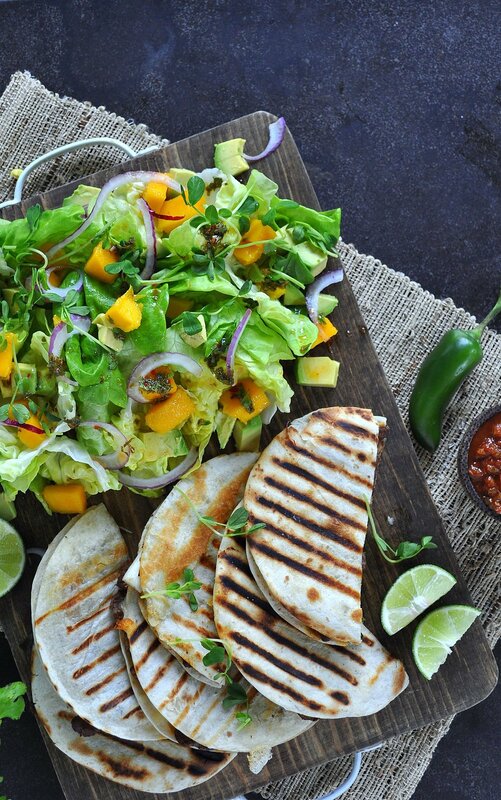 Steak quesadillas with mango avocado salad. This meal is part of my ongoing series with FBC where I share wholesome, family style meals you can create in about 20 minutes. This is one of the simpler 20 minute meals and I think, a great place to start in the series. Some other great recipes to try would be this Soy Glazed Salmon or this Vegetarian Lentil Chili Board. The steak could be replaced with chicken, ground meat or soy or even a rice and beans mixture (although it would likely add to the 20 minutes) I would love to hear other variations you have tried. And the fruit in the salad - a must! I have a fun way to cut a mango that I think is a game changer, but then I think I would be grossly overstating the importance in in life of how one cuts a mango. And the best thing about this dinner - its pretty much portable and suitable served at room temperature. That translates into eating in the back seat of the car, or taking leftovers for lunch the next days. Both of which are currently high priorities in my life this spring. Here is a direct link to the recipe for Steak Quesadillas with Mango Avocado Salad. Let me know what you thought and for those of you staring straight ahead to a busy spring, I hope this meal and some of my other 20 minutes solutions, make the busyness just a little less busy.